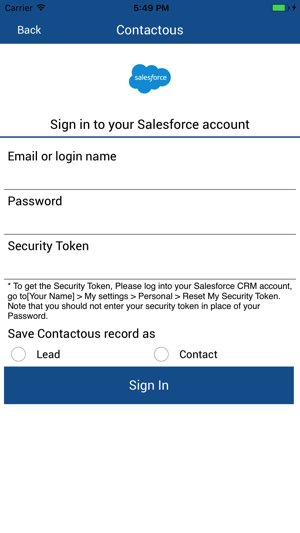 Contactous Mobile App captures the photograph of business card and sends to your secure database maintained by Contactous, which can be accessed by a web application. There, the card is manually entered with high degree of accuracy. Attempt is made to even capture the handwritten notes on the card into the database. Cards of both individuals and companies are entered. The information of the card is then combined with other contacts of the organization to provide relationship intelligence. The system works like an internal connectivity system for an organization. This centralized database can connect to CRM, Marketing Automation, Email Marketing, Campaign Management, Support, Supply Chain and Accounting Systems. 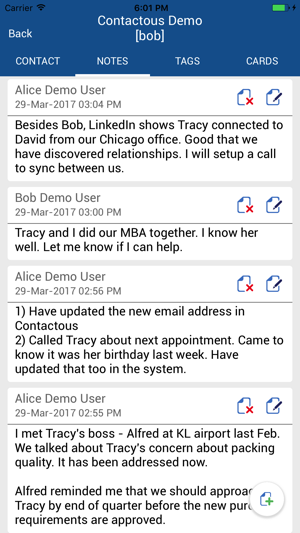 To use this Mobile App, your organization must be a customer of Contactous. 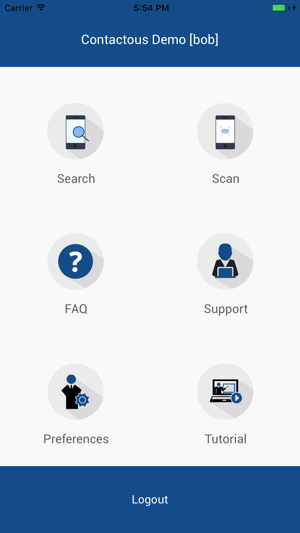 Within an organization, the application can be freely used for unlimited users. To capture the photograph of business card and send to our data entry operators who enter the data manually. 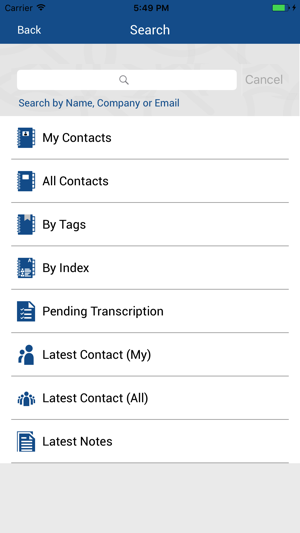 The application also provides the functionality to search the company's contact database by name, company name, email, tags and through index tabs. A user can also access list of entire company contacts or narrow down to one's own records. 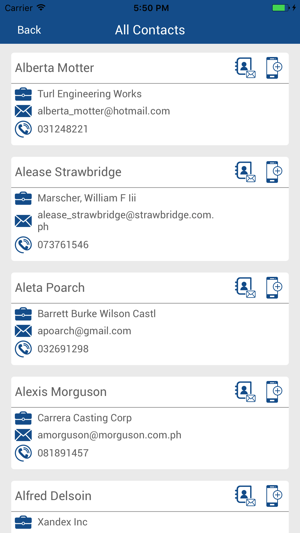 HOW DO I CAPTURE GOOD BUSINESS CARD PHOTOS WITH THE MOBILE APP ? - Make sure that there is good light on the business card while capturing the photo. Natural light is the best. - Avoid shadows on the business card. - If the card is in a folder or album, it would be best to take it out. - Place the card on a flat surface while taking the photo, instead of holding it in hand. - Place the camera on top of the card and ensure the left and right sides of the card are completely within the grid. - Use the grid to ensure that the camera is parallel to the card. ​- Use a steady hand while taking the photo. A BUSINESS CARD IS IN PORTRAIT MODE. SHOULD I ROTATE IT TO TAKE ITS PHOTO ? ​It would be best to keep the business card in front of you in portrait mode, while the smartphone is in landscape mode. Ensure that the top and bottom part of card are within the grid. WHO DOES THE TRANSCRIPTION ? It is done by Contactous' full time operators, based in Philippines and India. A BUSINESS CARD HAS INFORMATION ON BOTH SIDES. DO YOU CONSIDER THIS CARD AS 2 RECORDS ? No, we treat it as a single record in the system. WHAT INFORMATION IS CAPTURED FROM A BUSINESS CARD ? We enter the following information from the business card: Full Name, Company Name, Mobile Number and Email Address. All the other information including notes can be entered by the user easily.